Stay here! Loved this home away from home. A perfect set up for our family to chill, with 2 older teens. Spacious, thoughtfully outfitted main unit on ground floor with gigantic master suite. Peek a boo views from private patio and kitchen. Lots of places to lounge and spread out. Kids had a separate twin room with 3 pc bath (not ensuite but totally fine). So many wonderful shared spaces: believe the photos! There is one other separate guest unit on site but the home was never crowded. Location was great, around the corner from a couple boutique resorts but very private. Would recommend a car at this location for going into town (5 mins on lively local roads), but there's also lots to explore on foot. Just a mini 5-10 min hike to the beach (totally unspoiled, nearly private, got up very close with whales and turtles) or 20+ min walk down the beach to the swanky El Faro Beach Club (passes included, which such a bonus!). Superb hosts, Charles and Patricia (and cute dogs), live on site and but were never intrusive. Like staying with busy friends. Charles is a 5* resource, suggesting shopping and dining recommendations, secret beaches to explore, nearby walks to panoramic views, endless info to help planning day trips etc. His tips made our week. Todos Santos is mellow but full of little surprises and nearby villages to check out. Lots of locals and expats, and mainland Mexican tourists too. Town is quiet at night, so our days were busy and evenings relaxing. Out stay with Patricia and Charles was wonderful. The location overlooking the ocean with the ocean breezes everyday was lovely, Especially on the roof top deck with the 360 degree view. A short walk to the beach down a dirt road gave you miles and miles of beach to walk with no one in sight. We espaciasly liked the El Faro beach Club which was the ultimate experience for us. There was no need to explore the rest of the coast after spending a day at the club. Lovely staff, Great good, no crowds and again miles and miles of beautiful beach to explore. Having been in La Paz for a month, Todos Santos was an excellent way to finish our vacation. Totally relaxing..,, loved the dirt roads... great restaurants, friendly people and everything you could want including mani/pedi hair salon and even an excellent chiropracter that I visited who saved my vacation. Patricia and Charles were lovely hosts. So friendly and inviting and full of wonderful suggestions and recommendations. Accomodations were soacious, very clean, plenty of towels and a fully stocked kitchen. The beautiful tile bathrooms were lovely. . There are several different apartments so they can accommodate any number of guests you travel with. We will return! Perfect place to relax, decompress, Breath in the green and exhale the red! An absolutely beautiful property! We were so lucky to spend a week at Casa Oasis. From the moment we arrived Charles and Patricia were welcoming and showed us all around their amazing property. The downstairs apartment is light, airy and spacious....the bedroom is large, with a huge closet/dressing area and gorgeous tiled bathroom. We had a single friend with us and he was happy with his bedroom and bathroom on the 2nd floor, not a problem for him. Patricia has done a fabulous decorating job, the decor is just wonderful and kitchen has everything you can possibly need. Pool area is relaxing and very nice, tho a little cool....which surely gets well heated as the weather increases to warm up. Our favorite was the rooftop deck/terrace! We went up every evening with a cocktail/beer to enjoy the sunsets. It's also a perfect spot to relax with a book, the views are incredible. We love to walk and walked to town and back almost every day, it's a good walk but we really enjoyed it. Not a hard walk to the beach either, and we did some beach walking as well. They have membership to a private beach club which is available for use, we checked it our one afternoon, very nice but with the beauty at Casa Oasis, it's hard to beat and leave. Charles and Patricia live on the property, but not a problem.....they are friendly and helpful when needed, but totally respect your privacy. We definitely plan to return and look forward to our next visit. There was much we loved about our stay here. The location was great, easy drive to town, easy walk to beach. The grounds are lovely, and include an organic garden guests can help themselves to. The apartment is spacious and comfortable. The kitchen is well equipped. The roof top sitting and viewing area was the best part of the whole place. Great views of the ocean to watch whales travel by or stop and cavort. Night sky viewing also stunning. And it was helpful to get Charles' advice on places to go, people to meet, things to do. What was less comfortable was having the 2nd bedroom of our two bedroom rental separate from the main floor apartment, out the door, up the stairs and past the other unit where the owners stay. Her bathroom was next door to her bedroom, but she had to go outside to use it. She didn't have TV/cable access, just a DVD player. My friend, who rented the apartment with me, felt she had gotten the short end of the stick (she had). So perhaps this apartment is better suited for just a couple, who will love the spacious and beautiful master bedroom and bath in the main floor unit. Or a couple with kids who would love the distance from mom and dad. Initially I had an issue with the TV and radio noise from the owners at night, but I got used to it as we became more familiar. I would return to Casa Oasis with my husband some day! 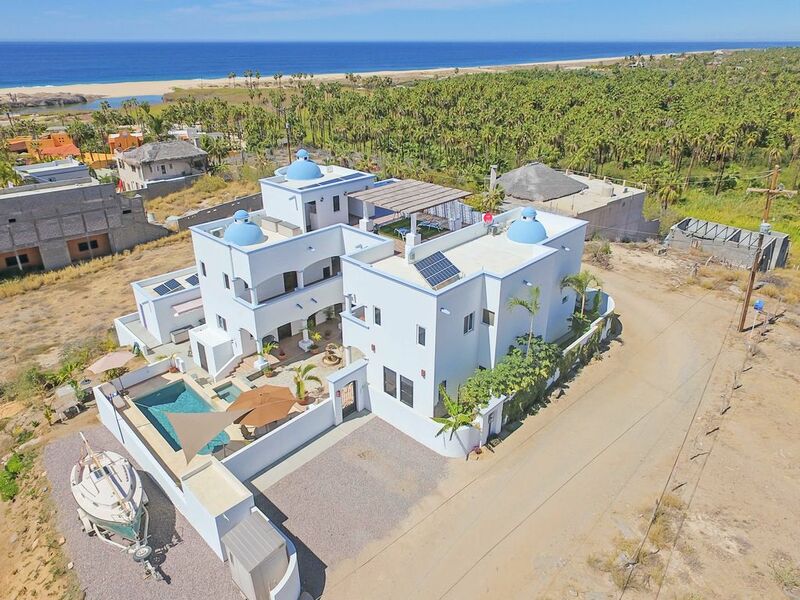 We loved Todos Santos, and I enjoyed the beautiful home and rooftop here.